Everybody knows that banana plants produce the bananas you slice up on your breakfast cereal, but there are other, less familiar uses for banana plants. These shrubs produce large, deep-green leaves on tall stalks, giving them the appearance of large trees. You can use banana plants to grow bananas but also to add a tropical touch indoors or outside. Green bananas growing high in a tree. Banana varieties that have edible fruits are members of the species Musa acuminata, which is hardy in USDA zones 10 through 11, and Musa balbisiana, hardy in USDA zones 9b through 11. They grow shoots best when temperatures remain 78 to 82 degrees F and fruit best at 84 to 86 F, but they can suffer chill damage at temperatures below 60 degrees F. Grow edible bananas in full-sun locations where the soil is rich in organic matter and is well-drained but still moist. Standard-size edible banana plants can grow more than 30 feet tall, and they require 12-foot spacing between themselves and other large plants. Dwarf cultivars can tolerate an eight-foot distance from other dwarf varieties or 20 feet from large plants. 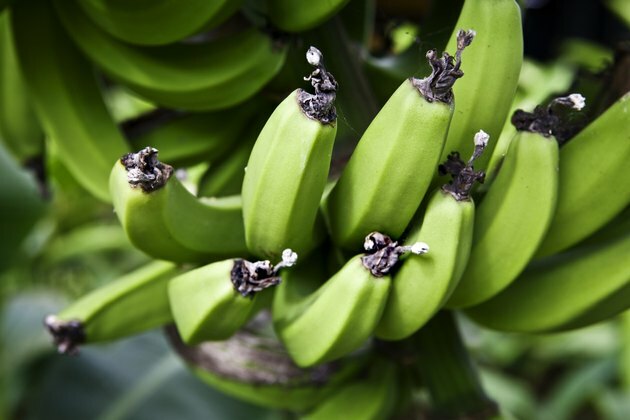 Banana plants suffer few pest or disease problems, and they take 10 to 24 months to produce ripe fruits. Dwarf Musa acuminata and Musa balbisiana banana plants work well to create a tropical screen or living fence in regions where they are hardy. In colder climates, the hardy or Japanese banana (Musa basjoo), can serve the same purpose during the spring and summer months. Each of these three kinds of bananas produces dense foliage and large leaves. The hardy banana plant requires the same care as the other banana plants, except that it dies to the ground when the temperature drops to 32 degrees F. If you cut a hardy banana plant down to two to three feet above the ground after it dies back naturally, it will regrow in spring. The plant can grow 12 feet in a single season. A single banana tree can become a large centerpiece in a garden, serving as a visual focal point. Edible banana plants provide year-round interest while the hardy banana is useful only as a showpiece in summer, except in USDA zones 9 through 10, where it remains evergreen. Planting a banana plant in a raised mound draws the eye to the plant while providing better drainage for its roots. When planting a banana plant as a centerpiece, place it in a location protected from high winds but far enough from neighboring plants and buildings so that its foliage can reach its full spread to showcase the plant's natural, lush form. Hardy bananas grow well as potted plants and remain green all year in USDA zones 5 through 8 when taken indoors to protect them from cold weather. Dwarf edible banana plant varieties, such as "Cavendish" (Musa acuminata "Dwarf Cavendish"), hardy in USDA zones 9 through 11, also can survive as winter houseplants. Besides winter greenery, a potted banana plant gives a home a tropical touch. The pot for any kind of banana plant must have bottom drainage holes so excess moisture can drain. Setting each banana plant's pot on a wheeled cart makes the large, heavy plant easier to move. Take the plants indoors before the first frost, and provide them with full, all-day sunlight. They grow especially well in an indoor sun-room. Banana plants become semi-dormant in winter. Water their soil enough so it doesn't dry out completely, but avoid overwatering, which can lead to rot. Both hardy and edible potted banana plants grow best when they spend summer outdoors in a sunny spot.